Refreshments available at the Cricket Club when they are playing at home ! From the Anglezarke Reservoir car park, walk down the entrance road, taking the right hand fork at the bottom, and again at the next junction. 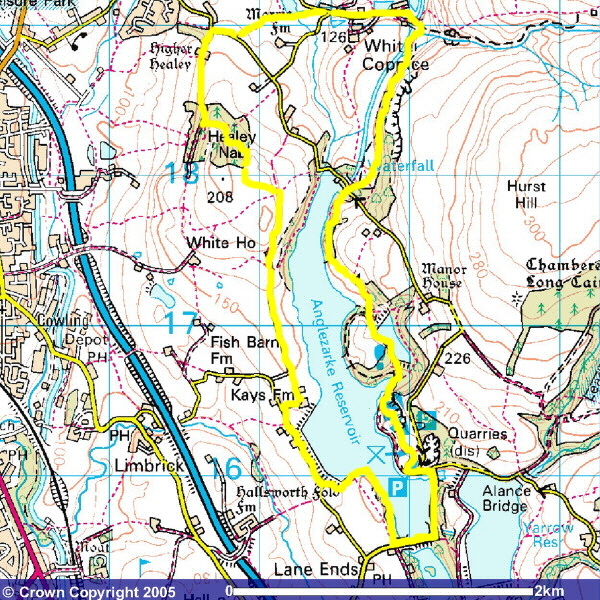 Follow the road round the south end of the reservoir, then take the path to the right. Initially there is a stone wall to your right. Follow the path, which sticks close to the side of the reservoir, then follows a broken wall below the embankment of the reservoir, until, at a gate you come to Back Lane. Follow this road/track to White Coppice Cricket Club (signed WCCC in places), going between the pitch and the pavilion, then take the bridge over the Goit and turn right. This path goes on for about 1 km until it meets the road over the top end of Anglezarke Reservoir. Go left up the road, then take the signed path on the right 40 or 50 yards away. This skirts the Northeast side of Anglezarke Reservoir, then drops down to the bottom of the embankment of High Bullough reservoir Carry straight on down the side of High Bullough reservoir, dropping down to the side of Anglezarke Reservoir.